Division 5 Assistant Portfolio Manager then Portfolio Manager April 2014 – December 2017 (Division 5 includes ageing as one of its specialities). The Wessex CRN was formed in April 2014, its geographic footprint is Hampshire & Isle of Wight, Dorset and South Wiltshire. It comprises 12 partner NHS organisations and 10 clinical commissioning groups. Research specialities are spread across 6 Divisions. 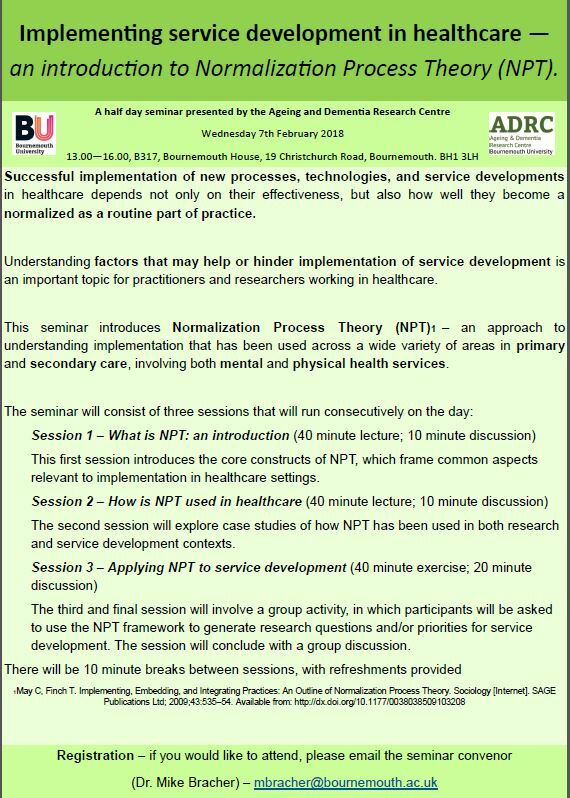 On Wenesday 7 February 2018 in B317, Bournemouth House, Lansdowne Campus at 13.00, there will be a half day seminar introducing an approach to exploring implementation of service developments in healthcare. Yolanda Barrado-Martin : Process evaluation of a Tai Chi exercise intervention to prevent falls among older people with dementia. Raysa El Zein : Dietary intervention study using coconut oil to evaluate effects of ketone metabolism in older adults. Christopher Hilton : The role of attention in spatial (dis)orientation in people with early signs of dementia. Joanne Holmes : An exploration of the factors that affect the extensive meal experience for cognitively active elderly living in residential care. 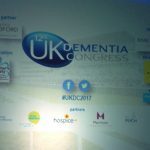 Mananya Podee : Improving holiday accommodation and service provision for people with dementia: An exploration of needs and expectations. Vladislava Segen : How does ageing affect ability to recognise places, stay oriented & navigate successfully? It was a highly successful afternoon with lots of good discussion and challenging questions posed for our students. 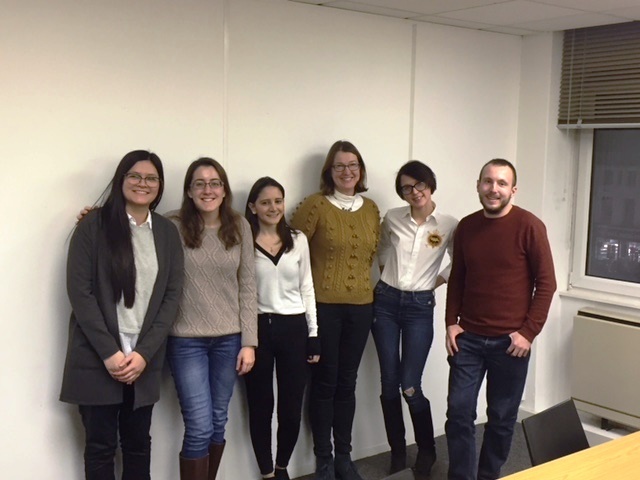 Well done to everyone who presented and we look forward to hearing more about your great work in due course! Leeds (14-15/11/2017). 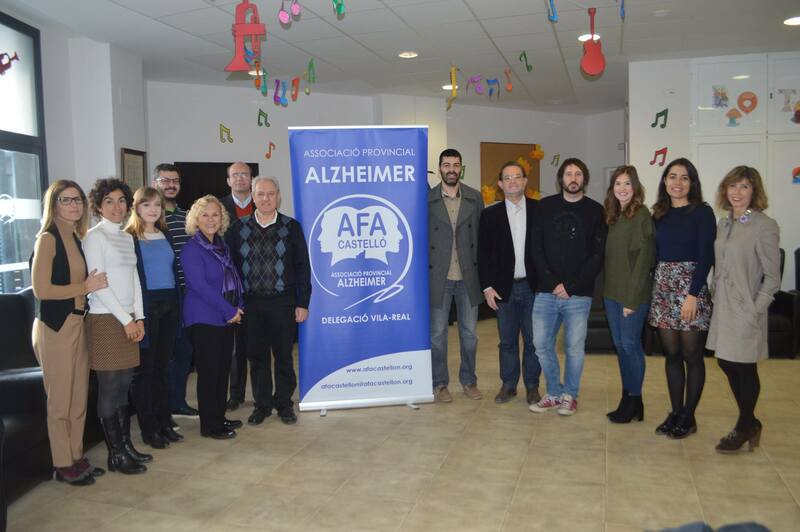 The focus of the meeting this year was, ‘Future Training for Future Health’. 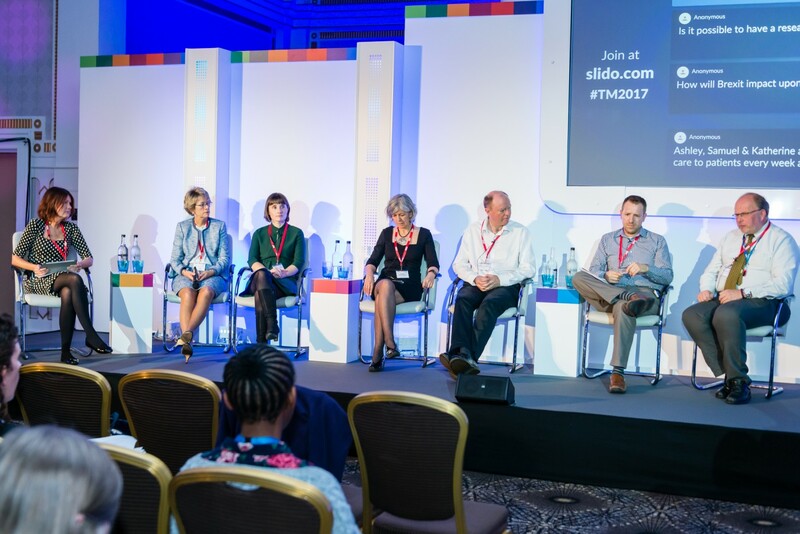 Samuel was invited to present on his own personal career journey to date, and then join the discussion panel to discuss future challenges alongside Professor Chris Whitty (Chief Scientific Adviser, Department of Health), Dr Louise Wood (Director of Science, Research and Evidence, Department of Health), Professor Dave Jones (NIHR Dean for Faculty Trainees), Professor Ashley Adamson (NIHR Professor in Public Health Nutrition, Newcastle University), and Dr Katherine Sleeman (NIHR Clinician Scientist, King’s College London). It was great to network with other NIHR fellows, and to have stimulating discussions around what aspects facilitate career development and the future challenges and opportunities ahead for health research including Brexit. 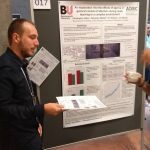 ADRC Post-doctoral Research Fellow Dr. Mike Bracher presents INSCCOPe baseline findings at the 2017 BAPEN Annual Conference Poster session. 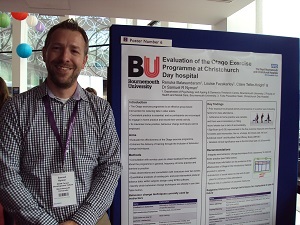 The Ageing and Dementia Research Centre (ADRC)’s Dr. Mike Bracher presented initial findings from baseline data collection for the INSCCOPe (Implementing Nutrition Screening in Community Care for Older People) project, at the poster session of the 2017 BAPEN Annual Conference (22nd November 2017). Led by ADRC co-lead Professor Jane Murphy, the project aims to improve screening and treatment of malnutrition for older people in the community, by exploring how best to implement service improvements for nutrition screening and treatment for malnutrition in older people. The aim is to maximise scalability and cost effectiveness of a new procedure for screening and treatment of malnutrition in the community, by providing an evidence base to support implementation across wider settings within the health service. 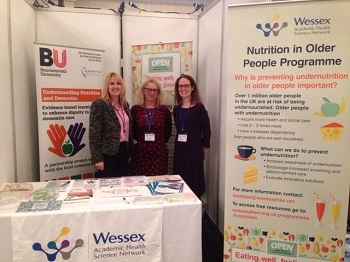 ADRC co-lead Prof. Jane Murphy (left), Wessex AHSN Senior Programme Manager Kathy Wallis (centre), and Wessex AHSN Teaching and Research Fellow Dr. Emma Parsons (right) showcase INSCCOPe and other projects within the AHSN’s Nutrition in Older People Programme at the 2017 BAPEN Annual Conference. ambivalence / doubt with respect to current logistical and organisational support for screening and treatment related activity. Work is currently underway to implement suggested changes to implementation of the procedure identified from data collected at T1 (two months following implementation of the new procedure through training sessions with staff). Following this, the third and final data collection point (T2 – 8 months following completion of training) will take place, after which the project will be evaluated. If successful, findings from the INSCCOPe project will inform rollout of the new procedure across Southern Health NHS Foundation Trust. 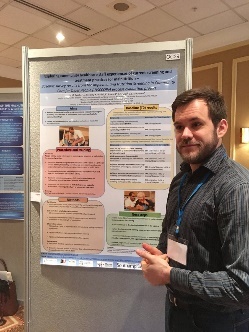 On Friday 15th September, ADRC’s Dr Samuel Nyman presented a poster at the annual falls conference held in the UK organised by the British Geriatrics Society. Working closely with the falls prevention team, Christchurch Day Hospital, Renuka evaluated the exercise programme delivered there and made recommendations on how to improve adherence with the use of behaviour change techniques. 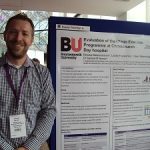 There was much interest in this work and the effective collaboration between physiotherapists and psychologists to improve patient care for older people. 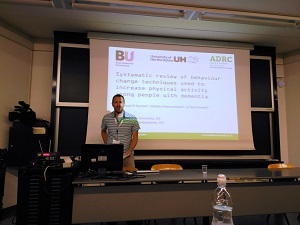 Dr Samuel Nyman, Yolanda Barrado-Martín and Iram Bibi from the Psychology Department and Ageing and Dementia Research Centre (ADRC) attended the 31st edition of the European Health Psychology Society Conference in Padua (Italy) from 29th August to 2nd September 2017. European and International researchers met in Padua on this occasion to learn about projects under the theme “Innovative ideas in Health Psychology”. Dr Samuel Nyman and Yolanda Barrado-Martín had an oral presentation each entitled: “Systematic review of behaviour change techniques used to increase physical activity among people with dementia” and “Acceptability of a tai chi intervention for people living with dementia and their informal carers”. 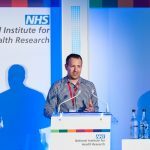 Dr Samuel Nyman was also in charge of chairing the session “Physical and cognitive function in later life” in volving these two presentations. 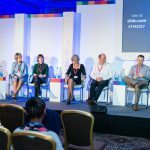 Those attending the session showed their interest in the topic and asked questions about ways of facilitating people living with dementia’s participation in exercise interventions. 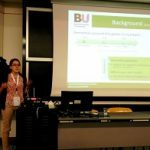 This was a great experience for Yolanda who presented for the first time her PhD pilot results to an international audience. 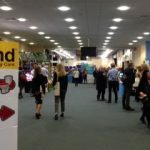 Participation in EHPS Conference was a valued addition in knowledge regarding interventions, exercise, behaviour change techniques, adherence to interventions, and relationship of patient and care givers. Titles of few among many interesting sessions are highlighted; “Mechanisms and adherence in interventions for patients with chronic disease,” “Caregiving and relationships in health,” “Methods for building better behavior change interventions,” “Dyadic regulation processes to promote health and well-being in romantic couples,” Developing and evaluating interventions to promote physical activity: issues in special settings and populations” and “Behaviour change theory and interventions in implementation research.” Iram Bibi found that the Poster presentations were also a great learning experience and an opportunity to socialize with scholars from around the globe. 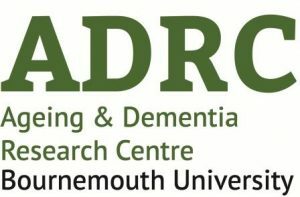 Jane Murphy from the Ageing and Dementia Research Centre (ADRC) was invited to join the ‘Fifth Annual Wessex Clinical Research Network Ageing Research Meeting’ on 13th September 2017 at Royal Bournemouth Hospital. 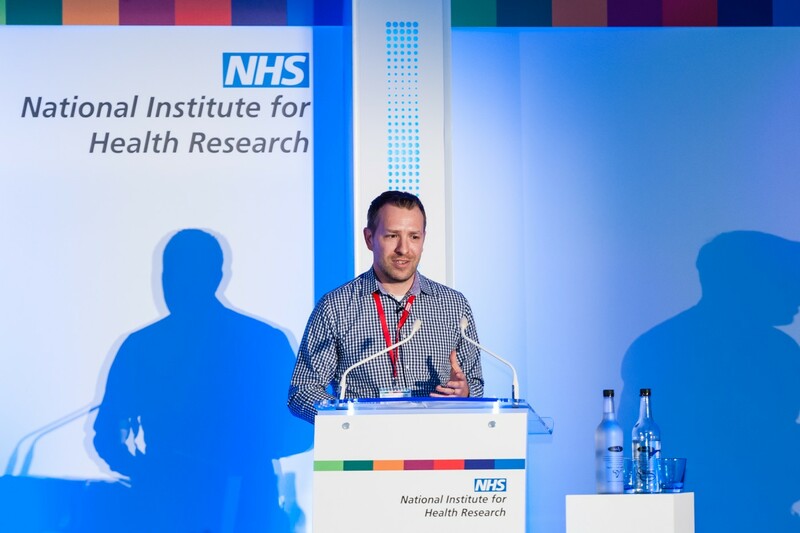 There were a wide range of interesting and insightful presentations by clinicians of mostly NIHR funded research in ageing including frailty, dementia and neurodegenerative disorders and stroke. 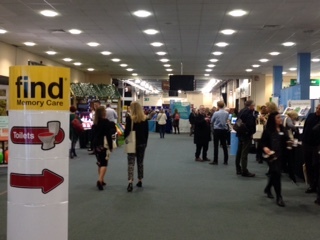 The Specialty National Lead for Ageing, and Lead for Ageing and Dementia Theme NIHR CLAHRC Professor Helen Roberts chaired the morning session followed by Dr Divya Tiwari, Clinical Research Network (CRN) Wessex Ageing Specialty Lead who chaired the afternoon session. Martine Cross, The Research Delivery Manager for Ageing at the Wessex CRN presented a key update on projects and plans. 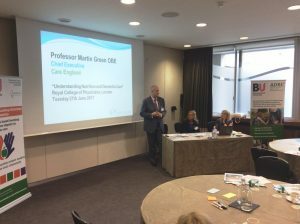 Please note that Martine will be coming to BU and for academics with an interest in ageing research and considering applying to NIHR, it would present an ideal opportunity to meet Martine and know more about the Wessex CRN and discuss your plans. For expressions of interest to join the meeting, please email Michelle O’Brien, ADRC administrator (adrc@bournemouth.ac.uk) and we will send further details. 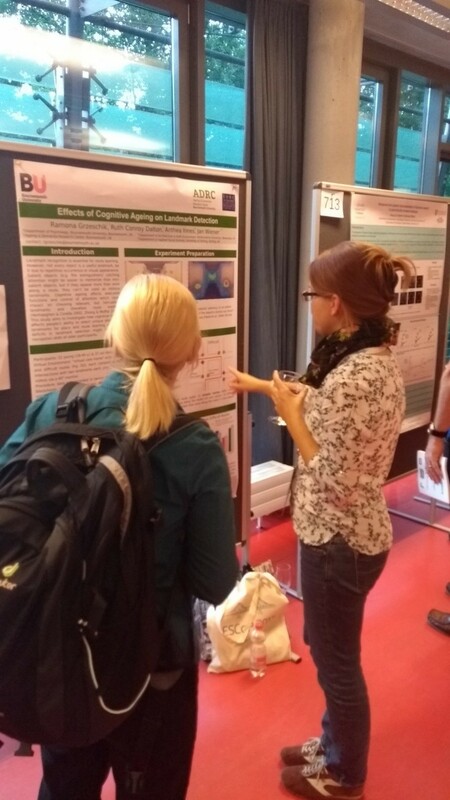 Jan Wiener, Ramona Grzeschik and Chris Hilton represented the Ageing & Dementia Research Centre (ADRC) at the 40th European Conference on Visual Perception (ECVP) 27–31 August 2017 in Berlin and the 20th Conference of the European Society for Cognitive Psychology (ESCoP) 3-6 September 2017 in Potsdam. The ECVP is an annual meeting that brings together researchers from Psychology, Neurosciences, Optics, Computational Sciences and more. Besides vision, other modalities are represented as well as their interaction (multisensory perception). The conference of the ESCoP is being held once every two years. 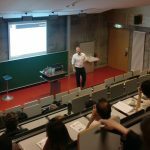 The society’s mission is “the furtherance of scientific enquiry within the field of Cognitive Psychology and related subjects, particularly with respect to collaboration and exchange of information between researchers in different European countries”. 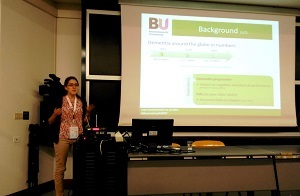 Ramona represented the ADRC at both conferences with her ESRC-funded project on Dementia-friendly environments. 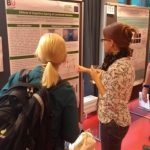 In particular, she presented a poster with the latest results of her wayfinding experiment where she investigated the route learning abilities and eye movements of young and old participants. 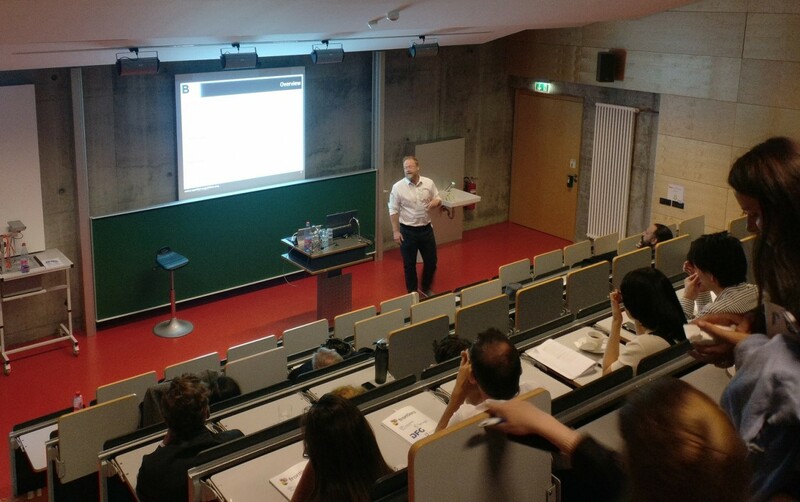 At the ESCoP conference, Jan gave a talk on “What can eye-tracking tell us about the cognitive mechanisms underlying successful navigation?” where he introduced a couple of experiments that investigated eye movements during route and place learning in Virtual Environments. 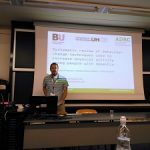 Chris presented his results at the ESCoP as well. 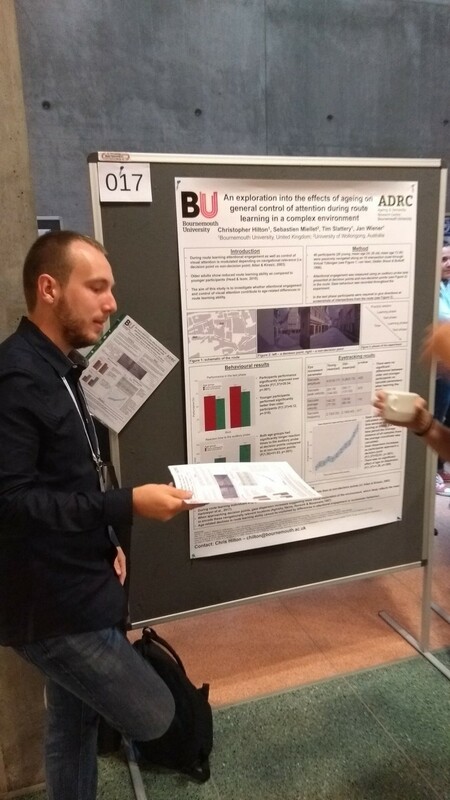 His poster titled “An exploration into the effects of ageing on general control of attention during route learning in a complex environment.” escribed his experiment using a natural looking virtual environment called “Virtual Tübingen”. 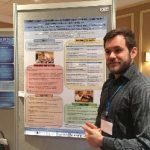 He investigated attentional engagement during a route learning task in young and old participants. Do you have an interest in people living with Cancer and Nutrition? 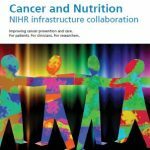 Then read more about the important activities of the Cancer and Nutrition NIHR infrastructure collaboration. 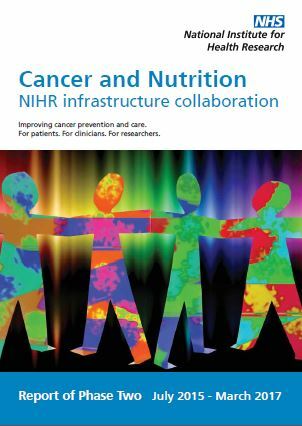 Since its establishment in 2014 the collaboration has sought to better enable a wide community of interested parties to bring together the high quality research being carried out in cancer together with the highquality research being carried out in nutrition, so that each can add value to the other in the interest of patients and the public. 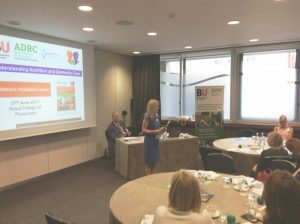 Professor Jane Murphy from the Ageing and Dementia Research Centre (ADRC) leads ‘Workstream 2: Professional Workforce – training and capacity building’ and is a member of the Steering Committee. The activities accomplished in Phase 2 are presented in the following report just published and more details about the collaboration can be found on the website. 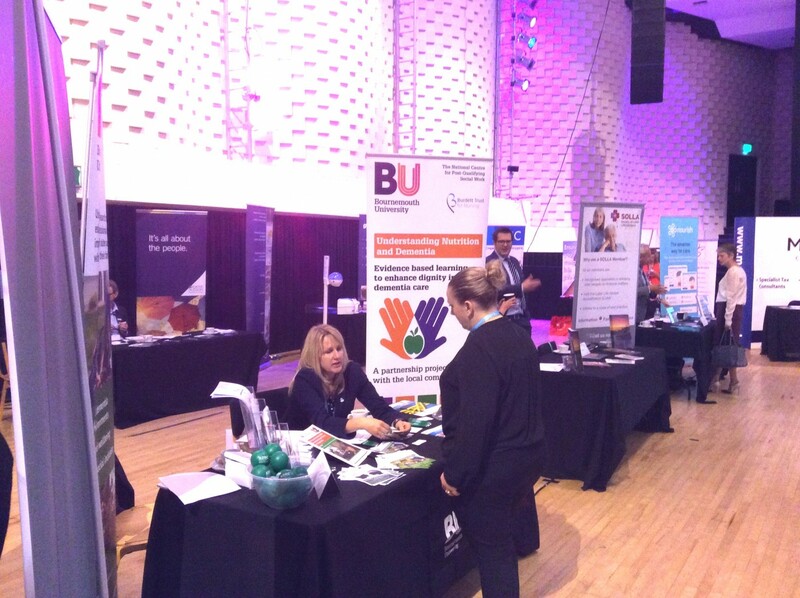 Please contact Jane: jmurphy@bournemouth.ac.uk if you would like to know more or have any questions or queries. 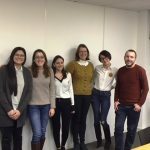 The TACIT Trial has a new professional video; please forward to anyone you know who has dementia or is a carer of someone with dementia who may be interested in taking part in this study: https://youtu.be/96Kyi_P7ngI. Further information can be found below and by visiting the website www.bournemouth.ac.uk/tai-chi. A YouTube clip can also be seen with Dr Samuel Nyman appearing on the BBC Radio Solent breakfast show and the breakfast team taking part in Tai Chi. The TACIT Trial Team at Bournemouth University Ageing & Dementia Research Centre are looking for people living with dementia and their carers to take part in an exciting new study. For more information, please get in touch! People with dementia and their informal carer will be helping with research to find out if Tai Chi is beneficial for people with dementia. 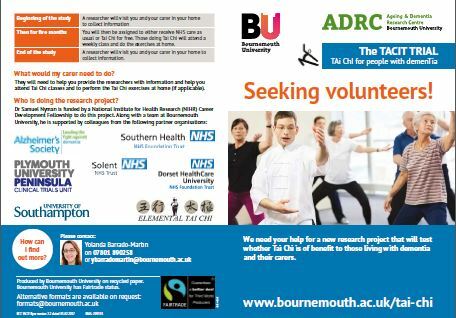 All participants will be talking to researchers on a weekly basis and half will have the chance of getting to do Tai Chi. 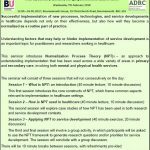 This study will be based in #Bournemouth #Ferndown #Christchurch #Dorchester #Poole #Romsey#Eastleigh #Portsmouth. 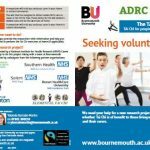 You can have a look at our flyer (https://goo.gl/vZzkWG) and our venues´ details (www.bournemouth.ac.uk/tai-chi). · Facebook #TheTACITTrial: Fill out our questionnaire (https://goo.gl/forms/WA5mk2vR8m9qWw0K2) with your contact details and we will get back to you! 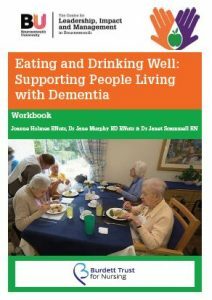 Professor Jane Murphy, Joanne Holmes and Michelle Board supported by Michelle O’Brien hosted the launch of the online version of the workbook ‘Eating and Drinking Well: Supporting People Living with Dementia’ at the Royal College of Physicians, London on 27th June 2017. 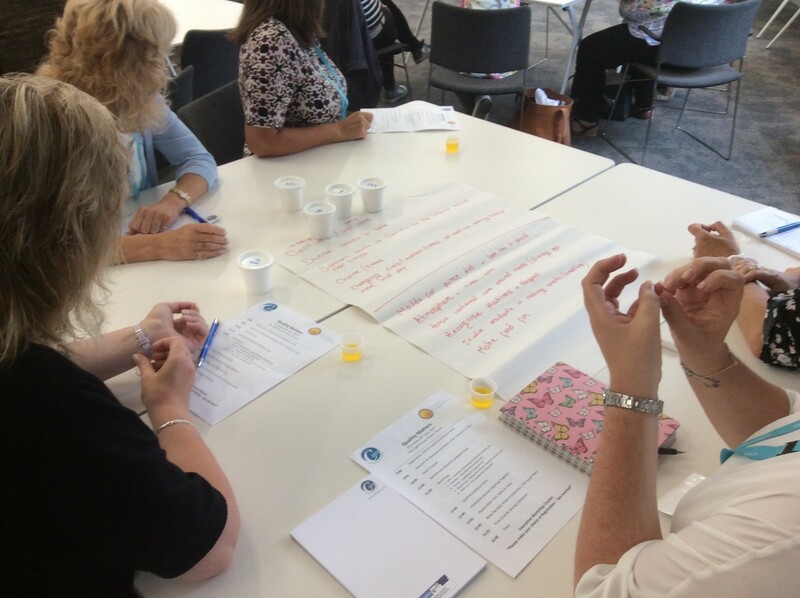 Attended by leading stakeholders across health and social care, charities including age UK, hospices, WRVS and housing organisations, this impact event explore how good nutrition and hydration can be improved for people living with dementia. The ADRC was delighted to welcome Professor Martin Green, Chief Executive of Care England who gave an inspiring keynote speech concentrating on the importance of nutrition to ensure dignity in care. He was passionate about the need to raise the profile of good food and nutrition amongst politicians and policy makers to enhance and maintain quality of life for many older people receiving social care. Other speakers included Jan Zietara, Head of Operational Delivery, Health Education England (South) who talked about current work and new developments to enhance the knowledge and skills of the health and social workforce with particular focus on initiatives for dementia education and training. 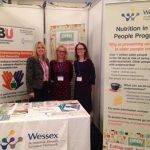 Finally, Kathy Wallis, Senior Programme Manager, Nutrition in Older People Programme, Wessex Academic Health Science Network highlighted the projects, resources and tools undertaken to address the growing concerns of malnutrition (undernutrition) in older people living in the community. Helped by a lovely afternoon tea, there was active and lively discussion by all participants about how the workbook could help improve the delivery of nutritional care for people with dementia across a range of health and social care sectors. All were very supportive of the training tools and left the event with lots of ideas and identified actions to put into place that would be followed up by the team! It is designed to be used in conjunction with a training film, also available via the website.